The Samsung Galaxy S4 comes with Android 4.2.2 Jelly Bean - the latest release of the Google platform available at the moment - and a laundry list of new TouchWiz features. The Galaxy S4 combines the best of both worlds and while it seems familiar, there's plenty new below the surface - so much in fact that you'd need a couple of days just to get accustomed to all the features. Here's a user interface video to start you off, which also shows the new air and motion gestures in action. We start with the lockscreen, which features the new lockscreen widgets introduced with Android 4.2, though Samsung fiddled with them a bit. The default lockscreen shows the time along with a personal message overlaid on beautiful photos pulled from TripAdvisor (with text at the bottom about where the photo was taken). The pages to the left contain different widgets - email, Google Now, Messaging, music player, Yahoo! Finance and News and you can download apps from the Play Store that add new widgets. You can change the greeting on the lockscreen by hitting the edit button. You can type something else, choose a different font and color. You can also disable the personal message altogether and remove the time and date info. Another nice trick is the Quick glance option we first saw on the Galaxy Note II. It uses the proximity sensor to detect you reaching for the device and it lights up the screen that shows the time, missed call and message counters, battery charge and music track info. At the top there are five (or eight in landscape mode) toggles that can quickly enable and disable features. There are more than five toggles, of course, you can swipe horizontally to get to the others. Or you can tap the new button that reveals a grid of all the shortcuts, 20 in total. You can rearrange this grid (the top row toggles are always visible). A two finger swipe directly opens the grid of toggles. Below the toggles is the display brightness slider complete with an Auto toggle. You can disable this slider to get more room for notifications. The homescreen looks mostly the same. Samsung has provided many of its own custom widgets like Samsung Hub, S Travel, etc. There's wrap around feature, which lets you scroll homescreens infinitely by always going from the last to the first one. You can pinch zoom to get into the overview mode of all homescreen panes. There can be up to 7 and you can easily add, remove and rearrange panes from here. One pane is marked as "home", that's the one you go to when you press the Home button - you can choose a different homescreen as the default quite easily. The app drawer hasn't changer really since the early days of Nature UX. The app shortcuts are presented as a customizable grid, alphabetized grid or list and you can hide shortcuts (good for bloatware you can't uninstall), view only downloaded apps, uninstall apps and add folders. As before widgets are in a separate tab in the drawer. 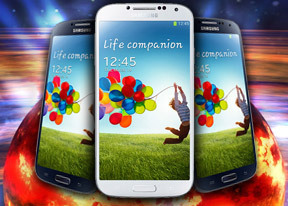 The Galaxy S4 comes with Multi-window. This lets you run two apps side by side on the screen. You can adjust the division line giving one app more space. Only compatible apps can be used with Multi-window, for now that means mostly the ones that come preinstalled on the phone. The settings menu has been redone in the latest TouchWiz version. Instead of a scrollable grid of icons and sections Samsung has went with a tabbed interface. On top you get four tabs - Connection, My device, Accounts and More. and you can find the relative features in their corresponding place - display, for instance, is in the My device tab. We like what Samsung has done with the latest iteration of TouchWiz. Despite pilling feature upon feature, the whole thing really feels intuitive and well organized. Placing widgets, rearranging menu and homescreen panes, getting to your important settings, etc. is now faster than ever. It's also very responsive thanks to the great hardware inside.